Cracking read Debs, this fella certainly knows his stuff! You can certainly get a feel for how much better we can be as a pressing side as the players get more and more comfortable with it and things become more and habitual. We saw this as the season progressed and with a full pre-season under his belt and of course more time in between matches I am sure we will see further improvements this year. I think this Wijnaldum signing looks like we could be playing a 4 3 3 or a 4 3 2 1 this season..just a thought. I've been thinking about WHY we seem to do so well against the bigger sides, particularly away from home and yet we struggle so much against the so called lesser teams. I've come to the conclusion that it's by and large the tactics that win us the game against the bigger sides and it's a lack of creative talent (and talent in general) that costs us against the lower teams. I look at the wins at Arsenal, at Chelsea, at City (plus others) and in every one of those games we have seen Jürgen's Gegenpress executed perfectly, we've won the ball high up the pitch, we've pretty much played with a false 9 every time, we've denied them time and space on the ball, really shortened the pitch and been clinical in front of goal. And in every game the opposition have kinda fell into the trap, they've tried to play through the thirds, to play their natural game, keep on the deck etc and its cost them. But against the bus-parkers there is a lack of ideas, a lack of creativity and IMHO there simply isn't quite the level of talent in the team. The club went out and bought Mane in the summer and early evidence suggests he was a cracking bit of business BUT he almost seems to be our most important player which is crazy. However, he is the ONLY wide player at the club (I'm not counting Lazar) so surely we need to be buying another one of similar ability and skill set? Up top we have got a couple of talented players in Studge and Origi no doubt about it but Origi is still largely unproven and Studge is always a moment away from tweaking another toe nail. Ings is an honest player but he is one who needs it put on a plate for him, not the sort who will make things happen against an 8 man defence. And in midfield we're simply dysfunctional, a bunch of 7/10 performers who are desperately in need of a supreme player who can and will grab a game by the scruff of the neck and in turn lift their performances too. Problem is we don't have that player. And defensively again it comes back to talent, I'm desperately hoping Matip can be that dominant ball winning centre-half we need so desperately because I don't see us winning too many 1 nils at the moment. I can see us going to Spurs and getting a win at the weekend I really can, but then I wouldn't be surprised to see us lose at Watford or at home to Hull later on the season either. I wasn't sure whether to resurrect this thread or start a new one but for now it's in here. Last season and also at the start of this one, it was noted that we tried to force things in the attacking phase. That we'd take shots instead of passing and vice versa, therefore not score when we really needed to. The Burnley game this season and the EL final last season come to mind. This seems to have been eradicated and we're now scoring freely and almost at will. Jürgen has clearly drummed it into his players that what they're practicing day in day out works, that the opportunities will come by being patient and waiting for the openings instead of panic setting in and snatching at things. The midfield also seems to have improved on everything. The positional play, the passing, the possession, the knowing where team mates are, when to pass, where to pass, whereas there was always that bit of panic and players getting in each others way and causing unnecessary problems. We can work through, round or over the press if a team dares to press us, something that we were still struggling with until a few weeks ago. Although some are still concerned with the lack of clean sheets and the defense generally, there's still been huge improvements in certain parts of it. We're preventing a lot of 1v1s, we're preventing more crosses, free kicks and corners but on some occasions the panic is still there which results in those crazy individual mistakes. The work on improving the defense is starting to take shape but the calmness and organisation still needs some work. We still have moments where too many cooks spoil the broth, get in each others way, cause panic and instead of the ball being cleared simply and easily it turns into a game of pinball and the inevitable goal against is scored. As I posted earlier in the "clean sheet" thread, the 5 at the back are still learning each others game. They've barely played together regularly but when, as with the other parts of our game, they start to believe what they're practicing works, those clean sheets will come. This team/squad hasn't properly got going yet, as Jürgen said yesterday, they've still a lot of development and improvements to come but it is nicely coming together, right across the pitch. Never negative about anything. Apart from LFC, Klopp, etc etc. The defence will come in time, with Klopp its not just five players responsible, its the whole team defending from the front and that maybe takes a bit longer. At the end of the day I'd rather be scoring freely but be conceding too many than keeping clean sheets but not able to do anything at the other end. Obviously it's not been a good month for the Reds, in fact a loss on Tuesday at home to Chelsea and i don't think I will be able to recall a worse run of results in quite some time. Understandably there has been a fair bit of anger and criticism but much of it has been without suggestion of how we should change things tactically to pull us out of this tail spin. I'be got my own thoughts but would be interested to hear what others think the manager should do? With the return of Mane we will soon be back with the 3 most potent forward players in the league and probably just as importantly get Lallana back into midfield. In the abscene of Mane various systems have been tried and none have really worked so let's get back to what was successful previously which means Danny and Divock on the bench and Firmino playing centrally. With Lallana back in midfield it also means Gini has more licence to make the late runs into the box which may not have resulted in goals but creates a lot of confusion for opposition defenders. Firstly I think Origi has dodged a lot of the criticism that could have been vented upon him. I think the moving of Firmino from the middle is the first mistake and then the continuation of this in bringing in Sturridge exacerbated it. We lose so much of our fluidity and space creation when Firmino isn't the tip of the spear that I feel even when he isn't in goal scoring form he's still bringing much more to the side than someone who is. That will sound strange and at odds with those that like to purely judge on goals per game ratio but for me Firmino has been, or at least close to, our best player all season. Secondly I think moving Lallana from the midfield role to keep the shape and bring in Can is also looking a poor choice. Emre has done nothing to suggest his form has improved and only 1 game in recent memory has he played very well. These two mistakes have led to us looking far more pedestrian in possession not through lack of pace but lack of movement and quick thinking. Our attacks are meant to be dynamic and we need to regain that and to do so it requires players who are intelligent enough to play for others as much as themselves. The vital cogs in our team when it comes to this are Firmino, Coutinho, Lallana. As much as Mane has been missed, I don't think his role in the side is as vital as people have tried to sell. Once we get back to these 3 being our key players in possession then the pieces around them will simply dance to their tune. Formation is one thing but dynamism can be in any formation and it's something that is so difficult to coach and so difficult to explain, sometimes it's just a movement of a yard that unlocks an entire defence but knowing to move that yard appears to be something you either have or don't, you rarely see someone develop it. Spot on that, Luke. I for one was thinking we needed to fit Sturridge in somehow, but recent evidence suggests it's just not going to work out. Impact sub now. You're right about Emre, though. I don't like to see our lads cop it for a general run of poor team form, but he seems to just not fit the 'dynamic' model you're referring to in any way shape or form. Not quite sure what he's there to do when he plays. I think it's very clear that Jürgen has his work cut out for him from a tactical standpoint given that we are unlikely to sign anyone in the window and we're enduring just about the worst calendar month in I don't know how long, a loss tomorrow night would probably put it up there as the worst I can recall in some time. So something has to give, either he changes the shape, the players or the way we are playing. - Teams are sitting ridiculously deep, it's not just the back four but their midfield is sitting virtually on top of them so it has become very difficult to play between the lines. The opposition are literally daring us to play through them or to get it wide and cross the ball. We haven't managed to do either. - We are sending too many players forward. You can guarantee that by the 8th-10th pass of an LFC attack that both our full-backs will be high and wide, our defensive line will be getting close to their final third and most of our midfield will be level or beyond the ball. - When we do inevitably lose the ball it's too easy for the opposition. Gegenpress is all about winning the ball back quickly when you lose it and always being superior in transition. Some have questioned whether our lads are simply knackered and there might be some truth in that but I just think it's too easy for the oppo to slip the press. We commit so many forward that they only need to make one or two passes and they are well and truly in the clear with the whole pitch to work with. We keep falling into the same trap. - Another problem with sending so many players forward is that they are sitting on each others toes and making an already crowded area even more busy. - Either we have to move the ball forward more quickly OR we need to commit less players forward when we do have it. This might mean keeping a full back in or better still, ask our narrow front three to play wider (even if it isn't their natural game). This would enable the full-backs to make their runs later. At the moment we rely on our full backs to provide all of the width, even with Mane coming back we need to be less reliant on Milner on the other side. - Improve our final third movement when Coutinho is on the ball. Opposing defences she...t themselves when he gets the ball onto his right foot within 25 yards of goal. They all key on it, look at the effort defenders make to close the shot down. We need to take advantage of that, whether it's its with a ball inside their left back for Clyne to run onto or a reverse pass going he other way it's something I would be looking to take advantage of. - We need more two on ones in wide areas. There's no point in crossing the frickin ball, we're not great at it and it's meat and drink to most EPL defences. Look at the way Arsenl play, when they get it wide they look to attack the box and the cut the ball back for on rushing midfielders to score. We should be doing the same thing, the middle is so packed and we keep losing the ball and getting turned around. We have to do better out. Wide but you can't create two on ones if your wide-forwards don't get wide enough for your full backs to provide the overlap. - As for who should play in the number 9 shirt, I'm a fan of Firmino in the position but long-term I really think we need a better striker. We need a player who is good enough for us NOT to need to send so many players forward when we have the ball because that will help us defensively (in terms of our shape) when we do lose the ball. 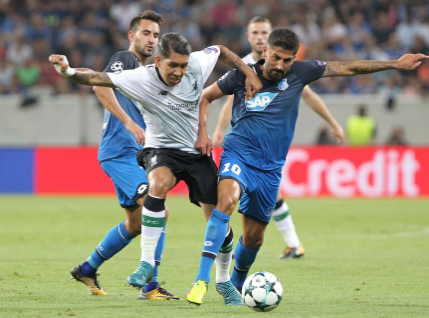 I was wondering, as many as you were, as to why Klopp persisted with Moreno and Lovren during the Hoffenheim game and why he didn't make any changes. I started reading a lot and came across a brilliant piece of analysis by BabuYagu (RAWK-poster). All credit goes to him. It's a long read, but it's worth it. "Firstly, that is one of the best drilled sides I have seen in attacking play. They constantly found ways to create underloads on our right and then switch to overloads on our left - ironically the thing I was tipping us to do this season with our two pacey inside forwards. Their build up play, for example, would drag Salah out of position. Then when a midfielder stepped into that area of the pitch the rest of our midfield narrowed and shifted across. This created a huge hole all night in front of Lovren & Moreno and they exploited this time and again. At least - that's what I felt when I first saw the game. I then went back and looked at some of it again and realised Klopp just let it happen. I know that is a really weird thing to suggest but if you look at how strong we make our right side and weak we make our left by comparison you have to conclude that we are actually doing it, by choice. Also we direct all traffic down that weaker left side. That's weird too right, but go back and watch any 5 minute segment of the game again and watch how players curve their pressing runs right to curve left, this naturally turns opponents to our left side to play. Now, something that can hold people back from better understanding football is pre-conceived opinions and ideas about certain things and players. The end result is you look for evidence to support what you think rather than look at the whole picture with no theory to prove. So I want you all to bin those things you believe to be true about Liverpool and certain players for the time being. The reason being I want us to collectively arrive at some answers to make sense of what Klopp was doing, because I was somewhat baffled. I don´t mean that in a negative way in that his choices make no sense like Hodgson, I mean that tactically there was a lot of very very high level tactical things happening in that game which will easily just pass over your head unless you are looking out for them. I personally know just enough to know that all the simplistic conclusions we arrive about certain players today are, in the main, wrong. (e.g. Bobby doesn't score enough, Lovren & Moreno are liabilities). I also know enough to be able to ask the right questions that might help us find the right answers. But more than anything else, I know enough to know that game was a tactical masterclass from two sides, most of which will have gone right over my head. I did see some things that I will share with you and hopefully others will have spotted some things to help us fill in the blanks. First of all - I think we we don't want to be attacked down our right flank and over compensate for that to discourage it from happening. One possible reason could be that Klopp mentions in the press multiple times how weak TAA is defensively makes me wonder exactly how true that is and to what extent we are minimizing his work defensively? But then if you look at last season, Milner got through almost twice as much work defensively as Clyne also and I am sure nobody would suggest Clyne is a weak full back defensively that needs protecting. Therefore I believe this is our first pressing trap. Klopp did the same at Dortmund, creating a hole in his formation on one side of the pitch, staggering his formation around it and then ambushing the ball as soon as it was played in that area. If you put aside any opinions on our players for a minute and just look at this tactically. Just look at what we did and ask why. This is really interesting for example. Most believe Moreno is a liability, and yet we get Mane to offer him literally no support at all. Look at Mane v Kaderábek (RWB) on our left compared to Salah v Zuber (LWB) on our right. It was very clear watching the game that Salah would stay goal side of Zuber all night and not let him get at TAA. Therefore there was never an overload on TAA on that side. This was especially weird because Zuber is right footed. If you want any wing back to have time on the ball it would be the inverted one who is likely to come back in on his weak foot, or play floated, aimless left football balls into the box. I semi expected us to direct traffic down our right for that reason and yet we did the exact opposite. We both weakened the left side by leaving Mane high and wide against Bicakcic (their RCB). We also directed all attacks down that weaker side. We did this by congesting play on the right to such an extent that attacking our left was the only viable option. Therefore the most common pattern of the game was for them to slowly attack down our right, wait for our midfield to filter across gradually, and then switch to Kaderábek who stayed as wide as possible to either always be free for a switch or, when Moreno shifted across to negate this, would leave a huge hole in the left half space between Lovren and Moreno for someone (Either Rupp, Gnabry or Kramaric) to attack. In the end (probably by Klopp's instruction) he kept his starting position narrow to minimise the impact of those runs off the back of Lovren. 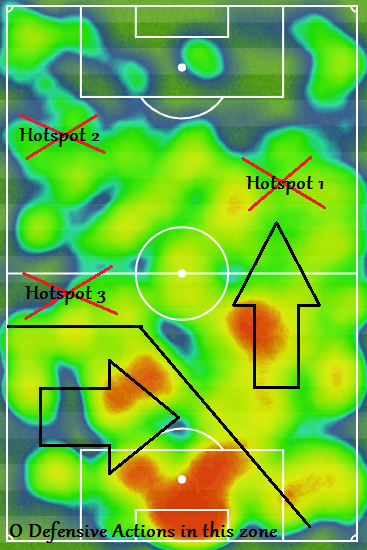 So while the heat maps for the game will be more to the right side, it's quite misleading as in reality, all their attacks happened on the left. Regardless of your feelings on individual players, it's clear we decided to overload Lovren and Moreno, not Hoffenheim. Hoffenheim didn't leave Mane high up the pitch and Salah deep protecting TAA. When the a midfielder shifted up the pitch to press - we narrowed and protected the right, not the left where we just left a hole. That has to be a tactical decision, right? So Can and Salah both screened brilliantly in front of TAA. Moreno had no support at all from anybody all night. And it's easy to see and make a tactical shift to prevent it, Klopp chose not to. Which means he wanted it to happen. Why? I have no idea. It's incredibly risky and placing an exceptionally large amount of faith in Lovren and Moreno to sort that out between them. My instinct after the game also was that man of the match was Mane. He murdered Bicakcic all night long. But then it's now quite easy to see why Mane was man of the match. He had no defensive responsibility at all. His only job last night was to stay high up the pitch and destroy Bicakcic all night. He did that perfectly but we do tend to focus on positive attacking play when making a call for man of the match so clearly Mane was always going to be that guy based on the tactical decisions we made. He was excellent though and showed once again why he would be handful for any side to have to deal with. As much as we left their RWB to exploit our left side, the likewise didn't pull him back to watch Mane at any point during the game either. So both sides were willing to take a risk on that side of the pitch. I therefore propose that the above was the ultimate goal of Klopp last night. He accepted the that Hoffenheim are a good side and attack in numbers. He accepted they would get chances against us and therefore tried to have an element of control over where and what type of chances Hoffenheim could create. He tried to control where they would have their underloads and overloads. We can infer this by the tactical decisions of Mane, Salah, the midfield 3 & Moreno. The boxes above on the heat map are the consequence of our tactics. White: Basically the white square is the area of the pitch we wanted them to have no attacks in. We put a wall up in front of the box here that they found almost impermeable. Ironically, their goal came from the one time we allowed them any space here at all which does in a way support this theory that this area was the most important part of the pitch to protect. Black: The black square is the "zone of death". It´s the area of the pitch that has the most possession won by Liverpool in any specific area (the image on the right is all Liverpool possession wins) and also had the least touches by a Hoffenheim player in comparison. This is the pressing trap I referred to before. Anything into this left half space we ambushed hard and aggressive to win the ball and set Mane away. Red: The red squares is the risk vs reward. We accepted they would have some success on our left due to leaving Mane up field and our midfield shifting right. However, we banked on Mane being far more dangerous attacking them in their red square compared to them attacking ours and this proved to be the case. It was a very ballsy strategy by Klopp but with away goals being so valuable, it's clearly a risk he was willing to accept for the reward of some away goals to take back to Anfield. I suspect he won't be so adventurous in the home leg. Their player who actually impressed me most was Demirbay. I loved how Hoffenheim used a different runner each time off the back of Lovren. That is really hard to adjust to because, for example, if Kramaric is the one attacking behind Lovren, Lovren starts instinctively looking for him on the pitch and making sure he can always see him. But Kramaric, Rupp & Gnabry were all taking turns to make that run and they set it up in different ways each time too. Demirbay was always the one who would find those runs with some quick passing or switch passes. He also put in a huge shift defensively too. I worried about the Gnabry-Kramaric-Rupp-Demirbay four in the middle of the pitch defensively. They are all more attack minded than defence and thought without a proper six behind them we would expose them here, but we never really did. Not sure whether that was a failing of our midfield in terms of creativity (we miss Lallana hard!) or just good play by Demirbay & Rupp... I suspect a little of both. I did call Demirbay as the key man before the game and he was every bit as dangerous as I feared - although we didn't really see his direct free kicks and long range shooting - yet. A word on Mignolet. I was worried before the game that the Migs who ended the game on Saturday would be the Migs who started this one looking a little rattled to say the least. But he was excellent. I have seen people discredit that penalty save but I remember a goalkeeper once saying that the easy penalty saves are usually a result of bravery to stand up and not make the penalty taker's mind up for him. If the taker is running up to the ball waiting for the keeper to move first, he ends up fluffing the penalty if the keeper stands tall. So well done Mr Mignolet and he built a very confidence performance on that moment of bravery. 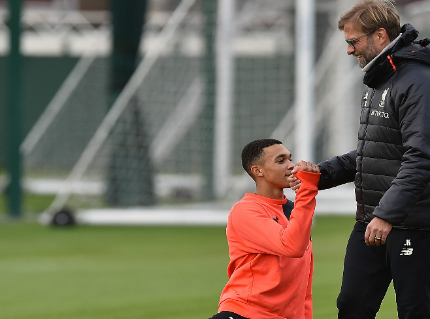 I want to end talking a little about Trent Alexander-Arnold. I thought he was excellent last night. I am starting to realise more and more we don't need Clyne. He's an outstanding defensive full back who can attack if needed, playing in a system which probably doesn't need one. Throughout last season and the beginning of this one, it´s clear we encourage attacks down our left side where we position our most aggressive defenders to attack the ball and launch counters. Lallana is usually on the right who is excellent at pressing play away from his side of the pitch. Gini on the left of midfield is probably our best transitions player in the squad who will be the midfielder to either initiate turnovers or launch counter on that side of the pitch. This would also make sense why Keita was targeted even more as in terms of tackles, interceptions and recoveries he is world class and does everything at high pace. He would be a perfect transition player for us on the left of midfield. Therefore TAA's defensive weaknesses that Klopp mentions are rarely exposed. Last night for example, he was beaten a few times and was responsible for our goal in the relatively small number of times he was exposed but he offers us so much going forward that makes that an acceptable risk to take. He beat his man four times down the left side of the pitch yesterday for example. To put that into perspective, Mane averaged 2.5 completed dribbles per game last season on that side of the pitch. And this is important because against a low block, attacking defenders with the ball and committing them to an action is the best way to break it down. Especially with full backs as it´s a run from a deeper area, coming in at an angle and leaves the better attacking players free to move off him into the space his dribble creates. He created 2 goalscoring opportunities at the weekend against Watford, for example. To put that into perspective, Mane was averaging 1.6 chances created per game last season. That doesn't mean I am advocating we get rid of Clyne or that he shouldn't be first choice now. More that how you can see in our system someone like TAA will be far more useful to us than Clyne in the long run. Once he gets his defensive game to the level Klopp seems to have set for him, I suspect we'll see him become a permanent fixture in the side. Exciting times for the kid." Thought it might make for some interesting discussion regarding Lovren, Moreno and Wijnaldum. In the Moreno player thread I posted another post by BabuYagu with more information on Moreno and the way he plays / why Klopp played / plays him. Therefore TAA´s defensive weaknesses that Klopp mentions are rarely exposed. Last night for example, he was beaten a few times and was responsible for our goal in the relatively small number of times he was exposed but he offers us so much going forward that makes that an acceptable risk to take. He beat his man four times down the left side of the pitch yesterday for example. To put that into perspective, Mane averaged 2.5 completed dribbles per game last season on that side of the pitch. And this is important because against a low block, attacking defenders with the ball and committing them to an action is the best way to break it down. Especially with full backs as it´s a run from a deeper area, coming in at an angle and leaves the better attacking players free to move off him into the space his dribble creates. He created 2 goalscoring opportunities at the weekend against Watford, for example. To put that into perspective, Mane was averaging 1.6 chances created per game last season. That doesn´t mean I am advocating we get rid of Clyne or that he shouldn't be first choice now. More that how you can see in our system someone like TAA will be far more useful to us than Clyne in the long run. Once he gets his defensive game to the level Klopp seems to have set for him, I suspect we'll see him become a permanent fixture in the side. Exciting times for the kid." What an excellent post, absolutely top quality that. Highlighted the above part simply because I didn't shut up banging on about this all last season, when we heard over and over about how we struggle to break down the bus parkers. Full-backs always become the outlet and the reliance on their attacking prowess is greatly magnified. Those who defended Clyne, that "this wasn't part of his role" couldn't be further from the truth and it's one of the key reasons why Trent is already ahead of Nat. The interesting part is how he demonstrates our propensity to 'allow' their more dangerous attacks to develop on our left in exchange for a closed door on the right. I disagree to some extent regarding this because this is where I was furious at Can and Wijnaldum, their transitional play and ability to track/catch men who ran off them was horrific in this game. I think he's giving either Jürgen's gambling skills too much credit or ignoring the deficiencies that our midfield had having not practised too much together and their current form. Jürgen would have changed things if he had a natural 6 to put into the game in my opinion, had Lucas been still at the club I think he'd have changed it at half-time. Thankfully in the second half, no doubt with the interjection of Jürgen, some of our midfielders came out in better form, still not good enough and hopefully tonight we'll see a totally different animal in the centre of the park for us, given that we've had all this time to adapt to life without Phil. No need to agree with all of it of course. Just trying to get a little discussion going other than the discussions with regards to our lack of transfers / transfer rumours. Thinking back about the game and looking back at the highlights, you do see a lot of what he is saying in his post. All he did was describe the tactics and the ideas behind the way we played. Wether the execution by both Can and Wijnaldum was good enough, is an other discussion. In a post he made later he did also refer to playing a 6 or even two 6's in front of our back four late in the second half to help shield our defence, so you are right about that part. Trent is indeed a very exiting prospect and I think most would agree with you. After seeing attack after attack break down last season whenever we played the ball to Clyne in the final third, it's a welcome change to have someone there who actually does have the offensive skillset to do something with it. Hopefully he will also develop his defensive side of the game well and we'll have an absolute top RB for years to come. Perhaps I worded it wrongly Danzel, I agreed with the tactics he was highlighting (quite brilliantly to be fair) just that Can's and Gini's execution of this was terrible in the game. There's no way Jürgen was willing to give the amount of space these two afforded and I do hear you that this is a separate discussion but is also integral to his point. We'll see, but I suspect our 'trap' may be a bit smaller in the home game tonight. Certainly fair how he highlights the fact that Mane was set up to be successful as much as by tactical design as it was to do with individual talent. My bad, misunderstood you then. I do agree with you though, sometimes the spaces were just too big, but the idea behind it, is quite brilliant. Looking back at it, that game was tactical masterclass by both managers, even more so by our own, who some say is more of a man-manager than tactically astute. Of course he also has Bucav and Krawietz to work with, both brilliant coaches. "Firstly, looking at the heatmap you can see that, once again, we pushed traffic down our left once again in the direction of the arrows. The demilitarized zone - i.e. The large area enclosed in black lines - contained 0 defensive actions as we aimed to simply push the play into areas we wanted rather than win the ball back here. This makes sense also as Firmino -> Milner -> Robertson would be a tougher line to play through than Sturridge -> Gini -> Gomez. The center of the pitch is always a hotspot in terms of defensive actions, particularly recoveries & interceptions obviously as its the area a lot of aimless passes and clearances end up in. However, three distinct hotspots could also be seen. Hotspot 1 - Tackles near the point of the arrow, interceptions & recoveries in the hotspot. I suspect this is where a lot of the misplaced/rushed passes ended up as a result of our pressure higher up the pitch on that side. Klavan 7 actions, Robertson 6, Henderson 4, Firmino 2, Gomez & Solanke 1. This looks like the main pressing trap as the very high numbers are the 3 players who surrounded this zone. Surprised to see no Milner though, maybe he was the one doing the pressing higher up with Bobby that resulted in the misplaced passes here. Hotspot 2 - Almost entirely interceptions and recoveries here. This is an area a lot of Palace attacks ended. Gomez 5 Matip & Bobby 4 Mane & Milner 2, Gini 1. I suspect this is an area a lot of cleared setpieces landed in given the high numbers for both Bobby & Mane in this area. Hotspot 3 - The end of the demilitarized zone marks another hotspot as we draw a line in the sand letting them know they must turn right here or be engaged. Hendo 5, Gomez 4, Salah & Matip 3, Bobby 2, Robertson & Milner 1. I suspect this is an area is a lot of cleared attacking setpieces and other Palace clearances from balls into their box too." I look forward to his post when we fail, and why we failed. I look forward to his end of season review, and how we failed, and why we failed. I look forward to his Champions.....meh whatever, silver lining and all, let the glass half full folks have their moment. Not sure what any of this has to do with "glass half full folks"? This is just a tactical analysis of a game which I found very interesting. I'm sure you'll be the first one to rub it in when we fail and why we failed. I look forward to your posts then. Other than that, do you have anything of note to add to the discussion? Great stuff that. Thanks a lot for that Danzel. If tonight doesn't show Hendo isn't a holding mid but needs to play further up the pitch then I don't know what will. Inefficient and reckless on and off the ball, respectively. Really interesting read that and good on ya for bumping this thread, it's my favourite on the board! 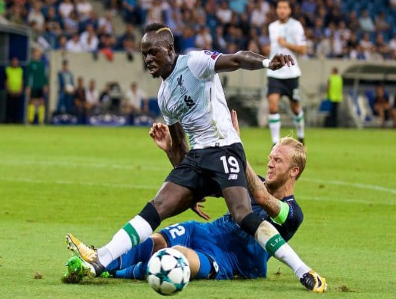 We certainly saw elements of that again this evening with Mane staying high and wide (particularly in the last 20 minutes) and Moreno exposed. Quite often it was simply one half decent pass or a quick switch and they were away on that left hand side (their right). Not sure I like to see such a tactic in a game like tonight when we're 3-1 up and another goal for them could have given them unnecessary hope and set up a difficult finish. Really makes you think, the post. Not what I quoted that's to link to the post, thanks, that was a good read. Don't know if I believe it totally or not. but, it's something to consider. Only read it because Scottbot mentioned it and I was intrigued so thanks Scottbot too. Assuming we stick to our guns, and the wee c**t is not sold to Barca in the next 24 hours -- our transfer business suggests a potential switch of formation from the 4-3-3 that we saw most of last season to the 4-2-3-1 that Jürgen used most often at Dortmund. My reasoning is that, we've only got 3 senior CM's -- Can, Hendo, and Gini. Lucas has gone, Milner isn't a real CM, and Grujic is still unproven. Also, Lallana and Coutinho are both CAM's rather than true CM's. Basically, this means that the three of Can, Hendo, and Gini will rotate at CM (with Grujic and Milner likely to get League Cup and FA Cup games). Coutinho will rotate with Lallana at the #10. The Ox will rotate with Mane and Salah on the wings. Studge will rotate with Firmino at #9. Sound about right? Think your going to see more license to roam forward for both Gini and Can as well as keeping the 4-3-3. I think we look alot stronger now from midfield up. OK we didn't get the strengthening we wanted at CB but like some have mentioned on here, the way we play we do look likely to concede goals. Personally we could have a walking brick wall playing at the back and we would still concede. The important thing now is to keep players fit. I'm glad the OX joined us as he gives us options in multiple positions. So I think we look strong and the way our forward line looks there's lots to look forward to. Oh and I forgot to mention we still have that Brazilian little sh*t if he ever decides to play for us again...personally I'd bench the c**t till we need him desperately or use him off the bench to maybe give us another option. I don't believe that a player, who obviously doesn't want to be at our great club, should be welcomed back with open arms even if he is a very good player....make him sweat specially in a world cup year.